Audience participation is hands-on and kinesthetic. This tactile learning makes the information more useable and relevant. Also, interactive keynote speeches are usually more visual as you must paint analogies to interact with the audience. Thus through interaction, you engage all three learning styles. An interactive speech makes sure the audience is listening and participating. Today, social media and increased digital saturation mean people are much more distracted, their attention spans are lower, and you have to work harder to engage them. Participation helps cement the message and make it meaningful and relevant for the audience. It keeps people on their toes; they know they could be a part of the speech, not just passively listening. Retention of information increases dramatically when the audience is involved in the motivational speakers conversation. The best motivational speakers know the speech is not about them, but it is catered to help the audience grow. An interactive keynote speaker will weave through the audience and start a group conversation around ideas like innovation, teamwork, and resilience. Including the audience ideas, makes them the center of the speech. The speech will morph to include and engage what's on people's mind. Very often, funny moments erupt out of people's natural interaction. These tend to be very memorable. The dictionary suggests introverts are shy reticent people. They predominantly get energy being alone with their thoughts and feelings. Susan Cain, the author of the Quiet Revolution, suggests upward of half the population are introverts. Introverts are often the most important group to engage, because they may not like speaking up in public; their voice and views are overshadowed or not heard. A small contribution helps shape the way the interaction of the rest of the group unfolds. Often, just knowing the speaker is going to interact, makes the audience more aware and engaged. A skilled interactive keynote speaker will know which audience members are willing to engage and which aren't. A new study finds that most people are spending upwards of half of their day isolated and interacting digitally, instead of face to face. This is causing increased levels of loneliness and depression. Now more than ever, people need to be stimulated with live interaction and engagement. Event planners bring people together for this reason and need to make sure they balance the schedule with Interactive Keynote Speakers to draw out the audience experience and ideas. 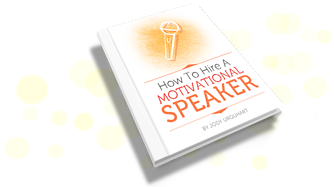 Get the most out of your training dollars by ensuring your conference agenda has a good mix of interactive motivational speakers.